MTV and Disney have decided to create their own virtual environments to better control the user experience and protect and promote their brands. 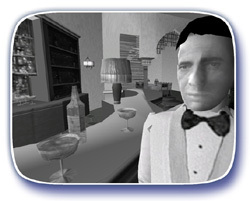 At this point virtual worlds are strictly experimental – yet another type of Web 2.0 social media to be sorted out. The primary author – you – is the director and owns the storyline. The virtual world is the story world. With most of these virtual world systems, you can define the characteristics of the world – the basic real estate. Scenes take place in settings in your virtual world. You find other individuals to play the of the major and minor character roles. The actors have their own avatars in the virtual world and use them to act out the scenes. The action and dialog is captured in transcript form. The story might be more interesting because it is acted by individuals that can interact. The author / director edits the transcripts, perhaps with the help of the actors and turns it into the finished book. When the book goes to press, all the participants (cast and crew) get some sort of title credit, and perhaps, depending on their significance in the whole project, a share of the revenues resulting from the finished work. While this may not yet be a fully workable scenario with today’s virtual world technology, it will certainly be possible in the not too distant future. This entry was posted in blogs & writers. Bookmark the permalink.